All you ever wanted to know about Adge Cutler & The Wurzels. This website is dedicated to the West Country's all-time favourite band The Wurzels and their founder, the late and greatly missed Adge Cutler, without whom Scrumpy & Western music wouldn't have been invented. If you are a new visitor to the site, or you have never heard of Adge Cutler or The Wurzels, then you've come to the right place to learn all about them! If you want a bit of background to The Wurzels and Adge Cutler, have a look at the Wurzel History and FAWQs (Frequently Asked Wurzel Questions) pages. The purpose of the Wurzelmania! website is to help spread the word to the uninitiated about Adge Cutler & The Wurzels' music, to share information and inform with others interested in keeping the spirit of Adge Cutler alive, and to fill in the gaps in our collective Wurzel knowledge gathered here for posterity. There has been some success so far - all of Adge Cutler & The Wurzels albums have now appeared on CD! We won't be happy until The Wurzels have been returned to their rightful place at the top of the charts! Please note that this is not the official website for The Wurzels and is in no way affiliated to The Wurzels. If you want to book The Wurzels, you will need to check the official Wurzels website. All the questions scattered throughout the Wurzelmania! pages have now been collected together in the Wurzelmania! UWQs (Unanswered Wurzel Questions) page - see if you can answer any of them, and help further develop this website. As well as the answers to the questions, if anyone out there has any historical information, news of Wurzels sightings or other up to date information, pictures, reviews, etc., we will be glad to hear from you. All help will be credited on the website! We are particularly interested in anyone who can say I Remember Adge! Wurzelography details of Adge Cutler and members of The Wurzels, past and present with a new Wurzelogram showing the timeline of band line-ups. FAWQs the most Frequently Asked Wurzel Questions about Adge Cutler and The Wurzels, with answers. Please take time to look at this before you ask us your questions! UWQs all the Unanswered Wurzel Questions about Adge Cutler and The Wurzels collected together - can you answer them? Wurzelspeak some Wurzel Lingo translated fer furriners! Wurzetteer some of the places associated with The Wurzels and Adge Cutler, with some photos. From Ashton Park and Bedminster to Yatton and the Zuider Zee, find out where all those places mentioned in the songs are! 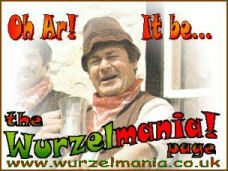 Wurzellinks links to more Wurzel websites! If you can't find something you've lost, try looking on this page. Wurzels On The Box Details of some TV and radio appearances by The Wurzels and Adge Cutler.